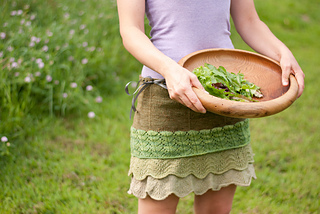 May’s skirt is inspired by the airy tendrils of young spring greens. 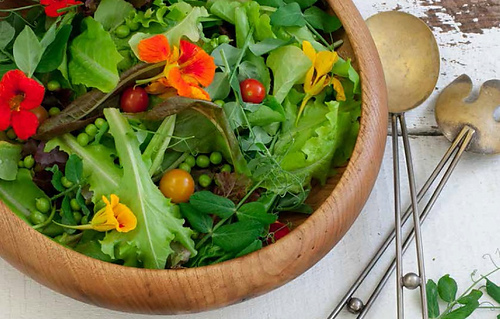 This pattern is paired with a recipe for Fresh nasturtium and pea shoot salad. Lacuca is derived from the latin name for lettuce. A ruffled skirt, flirty and fun- perfect for spring weather. 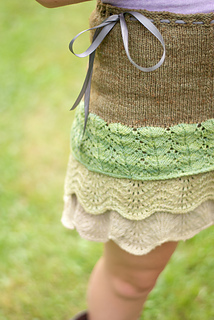 The body is knit from the top down with slipped stitch columns to support the fabric. 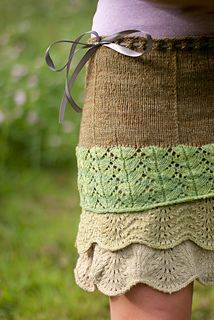 The lace layers are knit using leafy patterns and layered like a spring salad. 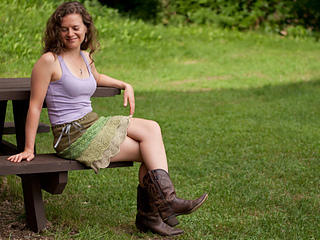 Skirt is knit from the top down with an eyelet round at the top for the drawstring waist. Purl rows at the bottom of the body make picking up stitches for the tiered lace simple. Intended to be worn with 4” / 10 cm of positive ease at the high hip.